12 Day’s of Christmas! 12 Days of Specials! 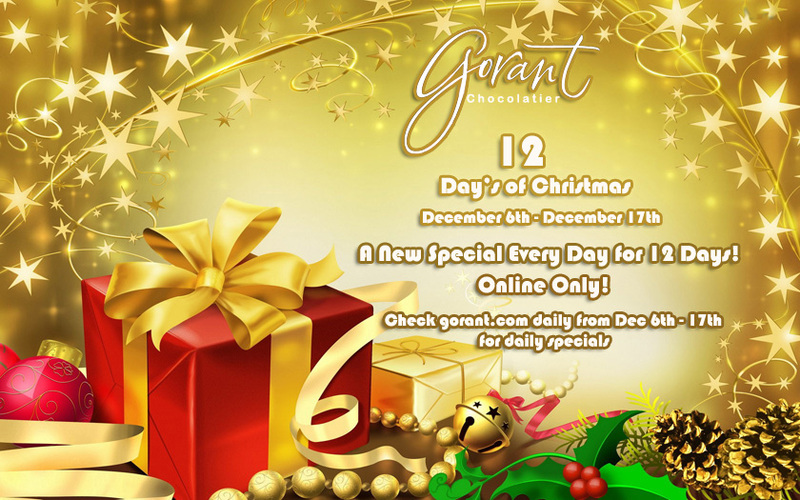 Gorant will be announcing 12 different Specials for our “12 Days Of Christmas” Event. Each day there will be a new special posted on Facebook.com/gorantchoc ,gorant.com , shop.gorant.com or through our news letter (Please see the contact us page and look at the right side-bar to see the form to fill out to join our mailing list). Make sure you keep checking back daily! Each day will have a limited supply of product, it’ll be first come, first serve basis. If you have any questions, please contact us through our contact page.